It’s not just me sitting here writing about the future of protein in my corner of the internet: Clean protein is hitting mainstream bookshelves! 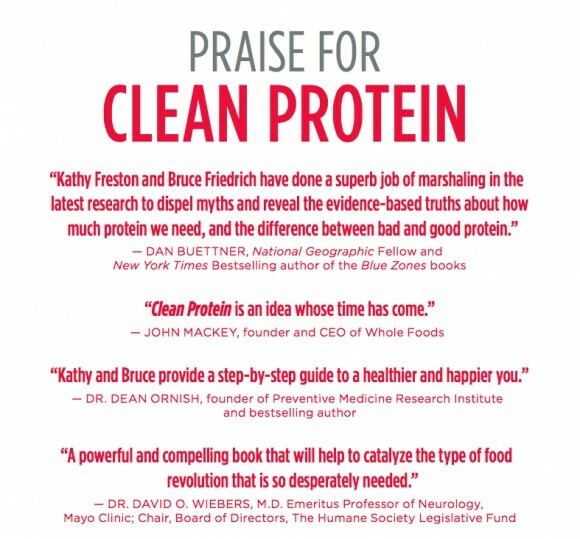 Check it: GFI Executive Director Bruce Friedrich has partnered with New York Times bestselling author Kathy Freston to release Clean Protein: The Revolution that Will Reshape Your Body, Boost Your Energy, and Save Our Planet. Combining a pragmatic look at the future of our food system and dive into the latest nutrition science, Bruce and Kathy have written a practical guide for creating a diet that is healthy, sustainable, and accessible to everyone. In other words, this book isn’t about “dieting” – it’s about a way of eating that will put both people and the planet on a better trajectory for long term health. And stay tuned – we'll be sharing some killer plant-based recipes from Clean Protein throughout the month on the GFI Blog!